The first extant photograph of the Peacock Room at 49 Prince's Gate, reproduced above, may have been taken in the spring of 1877, and shows parts of F. R. Leyland's collection of blue-and-white porcelain. 1: YMSM 1980 [more] (cat. no. 178). 2: Hobbs 1980 [more], p. 10. 3: Way & Dennis 1903 [more], pp. 31-32. 4: Pennell 1908 [more], vol. 1, p. 203. By 'Three Figures, Pink and Grey' they mean The Three Girls [YMSM 088]. 5: F. R. Leyland to Whistler, 26 April 1876, GUW #02567. 6: Pennell 1908, op. cit., vol. 1, p. 204. 7: Anna Matilda Whistler (1804-1881) to James H. Gamble (b. 1820), 8 and 9 September 1876, GUW #06560. 8: Pennell 1908, op. cit., vol. 1, p. 204. 9: Whistler to F. R. Leyland, [9 August 1876], GUW #08791. 10: Gladstone 1922 [more], p. 54. YMSM 1980 [more] mistakenly attribute the anecdote to Way & Dennis 1903 [more]. 11: See Merrill 1998 [more], p. 224, referring to the Pennell-Whistler Journal manuscript in the Library of Congress. On Whistler's decoration schemes for W. C. Alexander see Bendix 1995 [more], pp. 110-16; Merrill 1998, op. cit., pp. 151-53. The confusion may also have been caused by the fact that Alexander acquired several drawings of details from the Peacock Room (Designs for staircase for 49 Princes Gate [M.0578] and Peacock designs; (a) feathers on panel; (b) plan of ceiling; (c) feathers on panels; (d) feathers on panels and ceiling coffers [M.0579]). 12: Academy, 2 September 1876 [more]. 13: Quoted in Pennell 1908, op. cit., vol. 1, p. 205. 14: Merrill 1998, op. cit., p. 15. 15: F. R. Leyland to Whistler, 21 October 1876, GUW #02570. 16: Whistler to F. R. Leyland, [22 October 1876], GUW #02571; Leyland to Whistler, 23 October 1876, GUW #02572; Whistler to Leyland, [24/30 October 1876], GUW #02573. 17: F. R. Leyland to Whistler, 23 and October 1876, GUW #02572 and #02574. 18: Whistler to F. R. Leyland, 31 October 1876, GUW #02575. Vasari recounts how Antonio da Correggio 'having received at Parma a payment of sixty crowns in copper coins, and wishing to take them to Correggio to meet some demand, he placed the money on his back and set out to walk on foot but, being smitten by the heat of the sun, which was very great, and drinking water to refresh himself, he was seized by pleurisy, and had to take to his bed in a raging fever, nor did he ever raise his head from it, but finished the course of his life at the age of forty, or thereabout.' (Vasari 1912 [more], vol. 4, p. 121). Interestingly Whistler was at the correct age to appropriate this anecdote. 19: Hobbs 1980 [more], p. 13; see Audsley & Bowes 1875 [more], vol. 1, plate L, f. p. 49. 20: [18/25 July 1877], GUW #02599. 21: Merrill 1998, op. cit., pp. 15, 242-43. 22: Quoted in Pennell 1908, op. cit., vol. 1, p. 205. 24: Jopling 1925 [more], p. 216. 25: Quoted in Pennell 1908, op. cit., vol. 1, p. 205. According to Robertson, 'Whistler hated the ceiling, which was evidently Leyland's speciality and appeared in all the reception rooms' (letter of 5 December 1936, quoted by Preston 1953 [more]). 26: Morning Post, 8 December 1876 [more]; see Merrill 1998, op. cit., p. 246. 27: Menpes 1904 A [more], p. 130. 29: Whistler 1877 C [more]. Merrill 1998, op. cit., pp. 251, 253, fig. 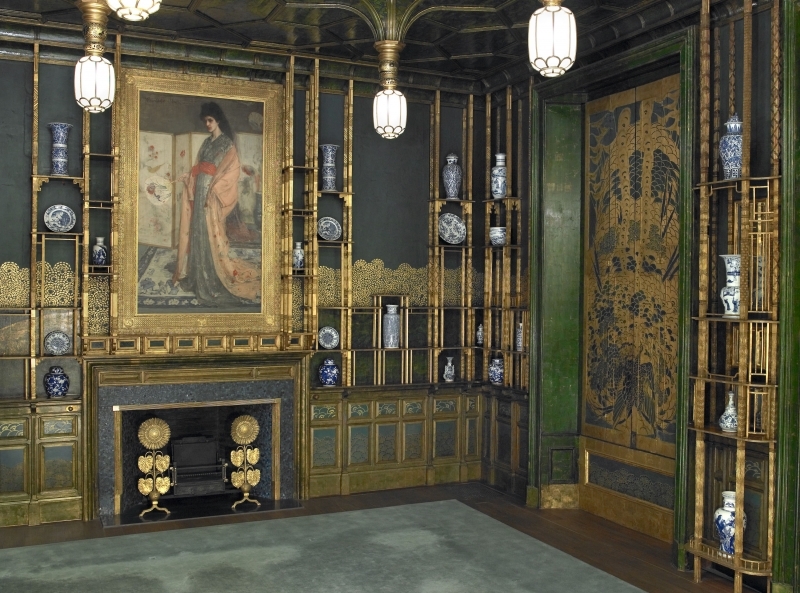 6.13, reproduced a copy of Whistler's leaflet, with pencil drawings of the Peacock Room by Edward William Godwin (1833-1886), in the Glasgow University Library. 30: Standard, 22 February 1877 [more], GUL PC1, p. 42. 31: F. R. Leyland to Whistler, 9 or 16 February 1877, GUW #02579. 32: Quoted in Pennell 1908, op. cit., vol. 1, p. 207. 33: Merrill 1998, op. cit., p. 270. 34: F. R. Leyland to Whistler, 6 July 1877, GUW #02581. 35: F. R. Leyland to Whistler, 24 July 1877, GUW #02593. 36: Whistler to Helen ('Nellie') Euphrosyne Whistler (1849-1917), [January/February 1880], GUW #06687.